Setting the standard that others follow, Cafe Yaucono Coffee from Puerto Rico. It has a rich creme, strong aroma and an excellent medium roast. Enjoy, Puertorican Gourmet Coffee with an aroma and a blend that reminds the drinker why it is #1. 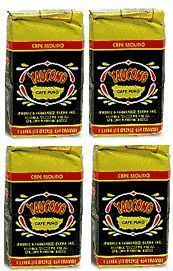 Cafe Yaucono from Puerto Rico available here at www.ElColmadito.com the Largest Puerto Rico Coffee Shop on the Internet.